Water fluoridation around the world is achieved through the purchase of chemically contaminated toxic waste chemicals from China which are then labeled “fluoride” and dumped into public water supplies in local cities and towns. That’s the conclusion of a shocking new mini documentary released today by the Consumer Wellness Center (www.ConsumerWellness.org). The 12-minute video documents the history of fluoride and how this toxic chemical is produced as an industrial byproduct of the phosphate mining industry. Decades ago, fluoride used to be released into the air through the smokestacks of phosphate mining operations, but this resulted in the widespread death of cattle and plants on nearby farms and ranches. To stop the deaths, phosphate mining companies installed “wet scrubbers” that captured the toxic fluoride chemical vapors. While consumers might think that deadly fluoride chemicals captured in these wet scrubbers are disposed of as hazardous industrial waste, the surprising truth is that they are sold to cities and towns as “fluoride” to be dumped into the local water supply where they are consumed by adults and children. This is all being done to “prevent cavities” — a medical claim that technically turns fluoride into an unapproved drug being used in an illegal mass medication scheme. The FDA has never approved fluoride as a drug, and no recipient of fluoride has ever been medically evaluate for their “need” for the drug. The video was created and narrated by consumer health advocate Mike Adams, the executive director of the CWC. Adams is best known for creating the “Blueberry Deception” documentary which revealed many name-brand breakfast cereals that claim to be made with blueberries are actually made with petrochemicals and artificial colors (and contain no blueberries at all). That video is also available at the CWC website. 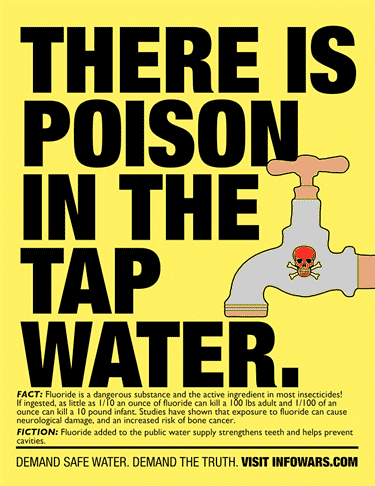 As The Fluoride Deception ultimately reveals, the practice of water fluoridation is a method by which the phosphate mining industry can dispose of its toxic waste byproducts by passing them through the bodies of people first.